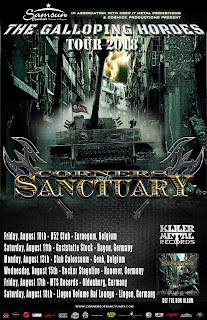 Killer Metal Records recording artist Corners of Sanctuary (COS) goes global as the band makes its first trip to Europe this August for a handful of live performances. This excursion takes them to Belgium and Germany as COS continues support for their newest album “The Galloping Hordes,” bringing their unique brand of traditional Heavy Metal to the world stage. "The opportunity to take our music to Europe and play live is amazing," said COS bassist James Pera. "We have been waiting for this moment for quite awhile… now it’s here and we are ready," he continued. The tour begins on August 10th in Eernegem, Belgium and finishes on August 18th in Lingen, Germany. See full tour schedule above.